Joe Wright is one of my favourite saxophonists and for years both his playing and his writing have left me mesmerised. He's an out-there musical thinker who went electric ("Judas!") using both solder and code with great results. 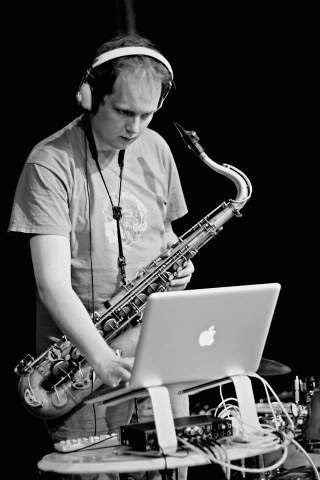 Recently, he has started to share some solo saxophone recordings he made in a church. Saxophone limits have been stretched by generations of jazz and avant-garde musicians. But ladies/gents/etc... This is how it's done. Over the last year or so, Wright has been pioneering the application of DIY hardware/software hacks to woodwind instruments (see his ingenious Fluke and ClariNot). For someone without his gruelling work ethic and supreme musicality, this might be confused for a gimmick. But Joe pulls it off. For recordings of his electronics in action, I heartily recommend picking up a pay-what-you-like copy of his work as part of experimental trio duck-rabbit, alongside Tom Taylor and James Opstad (I've included these for download at the end of the post). A week ago he uploaded a video called "Seafoam", which had me stumped. It features him, on his own, playing what seems like a million dirty, delicate tenor saxophone notes (or just one) in an Aberdeen church. I listened to it again and again, and I just couldn't get it. Over time, I came to accept that it was always going to overwhelm me, and that I would probably never make sense of it. And that's when it clicked: That's kind of the point: There is a lot of detail in this piece to marvel at, but when you witness something as relentless and all-consuming as this rushing down from the altar - all from the distorted perspective of a fish-eyed floor-level congregation - you cannot help but be so completely overwhelmed. The next piece from these recordings might have been a better place for me to start. Had I gone straight from one to the other, it would have been like keeping my mouth full of wasabi for a minute or so and then trying to eat sushi. Luckily I had a few days in between. When I got around to listening to the 7 Miniatures, I was ready for them. To save you the wait, I've embedded them below in reverse order. Throughout the suite, Wright displays a mind-bending breadth of extended technique, but these miniatures go beyond a demonstration of ability: Each miniature presents the listener with a thoroughly developed idea, economically composed into a single, biting poem.